One of Zambeza’s most popular indicas, Vanilla Ice brings a number of superb qualities to the table. Her outstanding Vanilla taste makes smoking her a mouth-watering experience and her outright crazy resin production makes her a top choice for hash lovers. Zambeza’s superb easy autoflowering variant doesn’t come with any noteworthy drawbacks compared to the original. It’s no surprise that Vanilla Ice shines with so many qualities given that she incorporates the stellar genetics of three top strains: a Northern Lights XL, a classic Skunk and a genuine Afghani. This indica didn’t just find a huge following because of her tasty Vanilla flavour but also because of her substantial resin production which makes her a dream for hash lovers and those who want to make concentrates. The plant grows to a beautiful sight with her abundance of frosty buds that will be sparkling in the sun in no time. 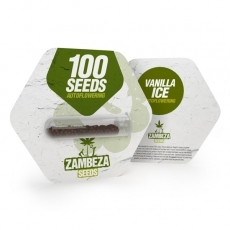 Vanilla Ice Auto delights with a short life-cycle of only 55-65 days after germination. In good conditions, you can look forward to yields of up to 300-350g/m² when you grow her indoors, with outdoor yields as much as 100-175g per plant. She will keep at a manageable height of 60-90cm indoors and won’t likely get taller than 100cm if you grow her outdoors. With the help of some ruderalis magic, Vanilla Ice Auto doesn’t really differ much from her feminized sister and shines with the same awesome taste, good production and yields. The only difference is a slightly lower THC content of 13% but this doesn’t make her a weak strain by a long shot! She delivers a deeply relaxing smoke that will make you stoned in no time and will also give you a nice happy feeling that will make you giggle and laugh at all sorts of things. A great smoke to hang with some good friends, watching movies or simply having a great time! Like the original, Vanilla Ice Auto has a wonderful aroma that blends smooth Vanilla notes with sweet and fresh notes, making for an excellent smoke that is really hard to resist once you take your first hit! Vanilla Ice Auto by Zambeza can be an excellent choice if you want a highly productive strain that will reward with an abundance of super-frosty bud in record time. Her flavour and effect are right up there with her feminized sister, making her an excellent autoflower that sure won’t disappoint! Vanilla Ice Auto bulk seeds are available in packs of 100 seeds so you can stock up on this tasty and highly-rewarding autoflower!